Photo: Mylene d'Auriol Stoessel. Luxury Lake Titicaca Tours & Travel. As a child, I read about Lake Titicaca in an illustrated history book and for me the name had the same resonance that Samarkand and Zanzibar have for any young armchair adventurer. But there was no picture of Titicaca, and so I imagined myself looking down from the high Andes on a small but profoundly deep lake, surrounded by dense jungle and shining like a lady's mirror far below me. Of course, in reality Titicaca is very different. But it is far from disappointing. The thin air gives both water and sky a blue luminescence, and distant points of land seem to float like mirages just above the horizon, where the tops of giant cumulus clouds gather, reminding one of the immense altitude. 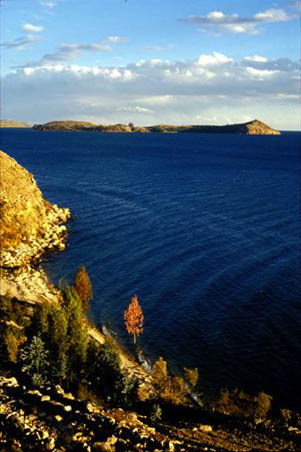 The largest tropical lake in the world, Titicaca is enormous. It covers an area of 8,000 square kilometres and is 170 kilometres long and 65 kilometres wide. But what we see today is just the vestige of what was once a huge inland body of water, known to geologists as the Humboldt Sea. This great sea covered what is now the altiplano, from La Raya to Uyuni, and lakes like Poopo and Coipasa in Bolivia are, quite literally, the puddles it left behind as it evaporated. These continue to be fed by rivers, nourished in turn by the meltwaters of the Andes. This immense body of water was formed by tectonic movements. When the Nasca plate met the Andes plate, the latter was pushed up to form the world's longest mountain chain and, between its eastern and western ranges, what was once the ocean floor became the altiplano, covered still by sea water. 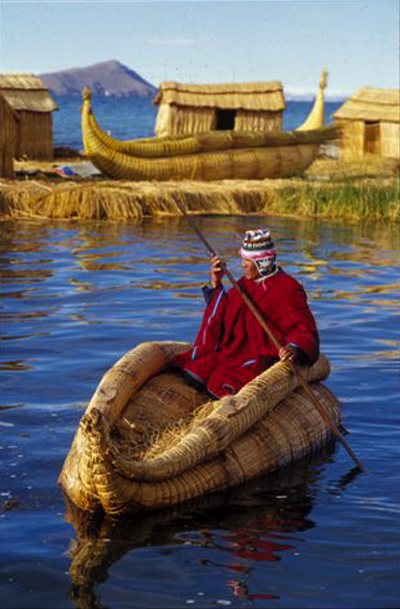 Today, Titicaca has a salt content of just 0.1% and is designated a fresh water lake. Five rivers drain into the lake and just one flows out. This river, the Desaguadero, carries some of Titicaca's waters far to the south-east, where they form the salt flats of Uyuni and Coipasa. Thus, Bolivia's Salar de Uyuni continues to grow as Lake Titicaca shrinks. However, Titicaca loses most of its water through evaporation and it is this process which, over millennia, is causing the lake to disappear. Just eight thousand years ago, Titicaca was 10 metres deeper than it is now and this process of extinction seems to have accelerated in recent years. For geologists, Titicaca is a result of plate tectonics. For the traveller, it is an area of astonishing beauty. But for the people of the Andes it is much more -- it is the hub of creation, the place where everything began. It is said that when the universe was created there was just the lake and that from its waters Wiracocha, the creator god, commanded the Sun and the Moon to rise and give light to the world. They say also that the Moon was brighter than the Sun when they arose. On seeing that injustice, the universe became sad. The Sun and the Moon were obscured as the sky darkened and the universe began to weep. These tears caused a great flood named Unu Pachacuti, which means "The Water that Transformed the World". Just one man and one woman survived the flood floating together on a small boat. This ancient story goes on to say that around this New World Adam and Eve many drowned pumas floated, swollen and grey, belly-up in the water. In Aymara, a language unrelated to and much older than Quechua, "titi" means "wild cat" or "puma" and "caca" means "eternal city". This century, a number of sub-aquatic expeditions to Wiñay Marca, among them that of the French explorer Jacques Cousteau in 1961, have explored the remains of a city lying just five metres below the lake´s surface. It is known that around 1200 A.D. there was a great drought in the region and the level of the lake dropped considerably. Archaeologists now believe that the local inhabitants who occupied the fertile new lands formed by the receding waters were later forced to abandon their newly built cities when the lake rose again to its old level. Harder to explain though, knowing as we do that the lake was once much larger and deeper than it is today, is the more recent discovery of ruins more than thirty metres underwater near the islands of the Sun and the Moon in Bolivia. One possible explanation might be that a geological fault caused by volcanic activity somehow caused the sinking of this ancient town. But many archeologists are now starting to consider the possibility that Andean civilization may be much older than previously thought, or even to concede that it may have been preceded by an earlier culture, or cultures, about which we know nothing. 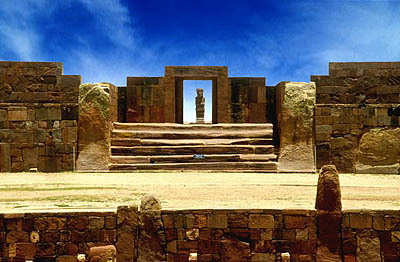 Templo de Kalasasaya, Tiwanaku, Lake Titicaca. Many of the local legends that still persist today tell how the Inca nobility spoke a different language from the rest of the population. A people's mythology expresses its history and, as we have seen, the most important part of any given culture´s sacred history is its myth of origin - its creation legend. Through myth a society explains its origins, both to itself and to neighbouring groups, thereby defining itself. The Inca creation legend is well known. It tells how the Sun God rose from Lake Titicaca and subsequently created the first Inca, Manco Capac and his sister, Mama Ocllo. These two set about populating the earth with the Sun's chosen people, before beginning the long march north in search of their promised land, finally establishing their dynasty in the fertile valley now known as Cusco. Here history and myth would seem to lend each other credence. It appears that members of the great Tiahuanaco culture, which rose to prominence around the first millenium after Christ, migrated north in search of better lands, perhaps spurred on by drought. In the Cusco valley they subdued the people already living there and formed a city-state. The Inca imperial expansion, led by the Inca who called himself Pachacutec, or "The Earth-Changer" did not begin until around 1438. Both warrior and statesman, Pachacutec founded cities, rebuilt Cusco and established social and religious laws. Archeologists have established beyond doubt that all of Cusco´s imperial buildings were constructed either during or after the reign of Pachacutec. It is clear, for example, that Ollantaytambo was still under construction at the time of the Spanish conquest. For many scholars of Andean history even the most cursory investigation of Ollantaytambo´s unfinished temple site reveals the indisputable influence of the architecture of the much earlier Tiahuanacan civilization. Once again it would seem that, as in all cultures with a tradition of oral history, historical events now lost in time have been passed on to us through storytelling.